Update: The Honda Civic prices start at Rs 17.7 lakh to Rs 22.3 lakh across India. The petrol CVT is available in V, VX and ZX variants and the diesel manual is available only in the VX and ZX variants. Full details are here. Honda is all set to reintroduce the Civic nameplate in India with launch of the tenth-gen sedan on 7 March 2019. It makes a comeback six years after the eighth-gen Civic was discontinued in 2013. For the six years the Honda sedan was away from the market, the competition in the segment has grown fiercer with introduction latest models of cars like the Skoda Octavia, Hyundai Elantra and the Toyota Corolla Altis. 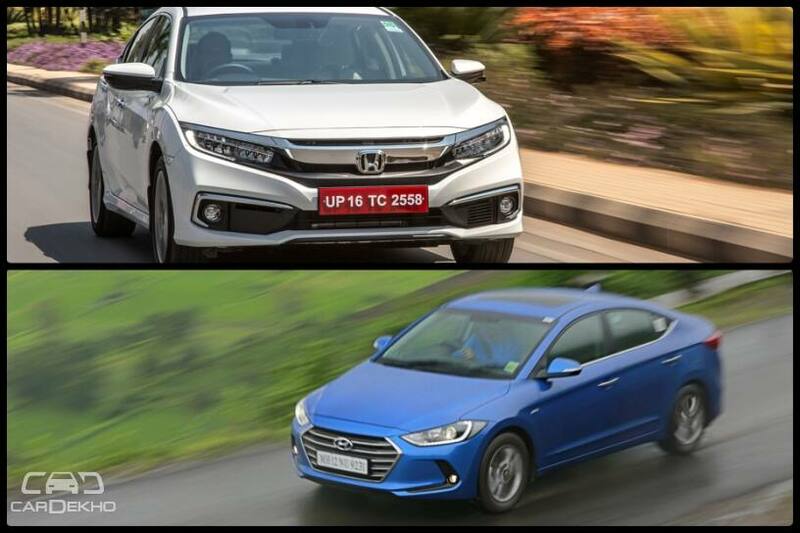 So, let’s compare the latest Civic to one of the best looking cars of the segment, the Elantra, in pics. Both the mid-size sedans carry their respective family look on the front. Where the Civic gets the bull horn grille, the Elantra sports the cascading family grille. In our opinion, the CIvic has an edge over the Elantra here. Both the sedans feature a coupe-like silhouette but Civic’s heavily raked rear windshield and extra length makes it more imposing than the Elantra. Both the sedans have an identical wheelbase. Where the Hyundai Elantra looks elegant and more like a family sedan, the Civic’s rear end has ‘sporty’ written all over it. The heavily raked rear windshield and those boomerang tail lamps make the Civic look like an everyday sports car. All variants of the Elantra are equipped with 205/60R16 tyres. Both cars get leatherette upholstery. The Civic’s cabin is done in dual-tone beige black colour scheme while the Elantra gets an all-back theme. The all-black colour combination usually makes the cabin look sporty while the beige-black theme makes it look spacious. Where the CIvic comes with a 7-inch touchscreen unit which protrudes from the dashboard, the 8-inch unit on the Elantra sits flush in the dashboard. Both the infotainment systems support Apple CarPlay and Android Auto. Both the mid-size sedans come with dual-zone AC which allow the driver and co-passenger to set different temperature settings. They also come with rear AC vents. Where the Honda Civic is available with 8-way electrically adjustable driver’s seat, the Elantra is available with 10-way electrically adjustable driver seat. The Civic comes with an all digital instrument cluster. However, instead of the large single screen on majority of cars, it is divided into three sections. The Elantra comes with the usual analog instrument cluster with an MID in the centre. Since both are mid-size sedans they should have a comfortable rear seat. However, where the Elantra comes with adjustable headrests for all three passengers, the CIvic gets only two. Both sedans are equipped with an electric sunroof. The Civic comes with electronic parking brake. The Elantra gets the conventional lever-type parking brake. Honda Civic comes with Honda Lane Watch. In this, a camera installed in the left mirror displays an image of that blind spot on a 7-inch screen inside the vehicle. The Elantra gets ventilated front seats, a feature which is not available on other cars in this class. Both the cars get six airbags for safety. However, where Civic gets them as standard, the Elantra gets them in the top-spec variant only. In other variants, the Elantra comes with dual front airbags. Honda Civic diesel is powered by a 1.6-litre engine that makes 120PS of power and 300Nm of torque. It is available with a 6-speed MT only. The diesel Elantra also gets a 1.6-litre diesel unit it makes 128PS and 260Nm. It can be had with both 6-speed MT and 6-speed AT. The Civic is powered by a 1.8-litre petrol engine that makes 141PS and 170Nm. It is mated to a 7-step CVT with paddle shifters. The Elantra comes with a 2.0-litre petrol engine that makes 152PS/192Nm. It can be had with both a 6-speed MT and 6-speed AT.